If you are Lord of the Rings fan, you have to check out these crazy ColourVue Saurons Eye Contact Lenses! Become Sauron with these amazing costume contacts. Every costume party has to feature at least one character from Lord of the Rings - that's the tradition. 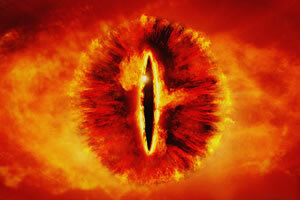 For this occasion ColourVue Sauron's Eye contact lenses have been created. Wear them and turn into Sauron - the most evil and powerful Lord of the Rings protagonist. The flaming iris and a black crack in the middle of the lens give an amazing effect that will impress all your friends and will surely help you win an award for the best costume. So try them now and become Sauron!